Mad Max story trailer rides into the "Eye of the Storm"
There's a new Mad Max trailer floating around the internet today, this one focusing on the narrative angle of Max's struggle against the villainous forces of Scabrous Scrotus, who believe it or not appears to be the least-pleasant of Immortan Joe's offspring. Scabrous Scrotus—which I think we need to acknowledge is a fantastic name—is, according to the Mad Max Wiki, Immortan Joe's third son, after Rictus Erectus and Corpus Colossus. He seems terminally psychotic, even by the standards of his old man. To be honest, there's not a lot of "story" in this story trailer. The Lord of the Scrote heads up a gang of "rabid animal" War Boys who jack the Interceptor and toss Max into what appears to be a very Thunderdome-like cage, where he takes what looks to be a rather thorough whomping. "His reign is through terror and fear. His purpose is power and vengeance," the once and future Road Warrior intones. "And my road goes through him." 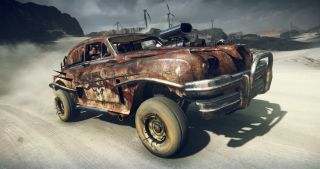 Still, I suppose that when it comes to end-of-the-world showdowns in the blasted Australian wasteland, that's really all you need: A car, a gun, and a muscle-bound lunatic. Mad Max comes out on September 4.